The unfolded protein response (UPR) is a cellular stress response activated in eukaryotic cells in response to endoplasmic reticulum (ER) stress, an accumulation of unfolded proteins in the ER lumen. ER Stress can be caused by different conditions such as high protein demand, viral infection, energy deprivation or excessive oxidative stress. UPR signalling is highly regulated and dynamic and integrates information about the type, intensity, and duration of the stress stimuli, thereby determining cell fate1. 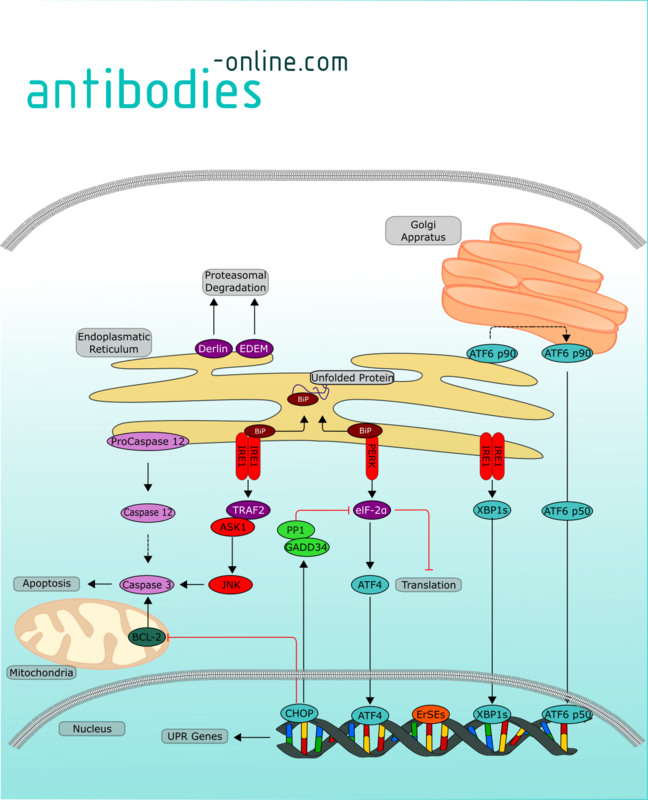 The regulation of UPR is mediated by three major proteins, namely inositol-requiring enzyme 1 (IRE1), activating transcription factor 6 (ATF6) and protein kinase RNA-like ER kinase (PERK)2. The unfolded Protein Response Regulator BiP/GRP78 has the abiliity to bind and inactivate them3. Misfolded proteins bind and sequester BiP which releases the UPR effector proteins and therefore reactivate them. Activation of PERK leads to phosphorylation of eukaryotic initiation factor (eIF). Phosphorylated elf-2α inhibits protein translation in order to restore homeostasis and enables ATF4 as well. In response to ER stress, ATF6p90 transits to the Golgi where it is cleaved by site-1 protease (S1P) and site-2 protease (S2P), yielding the active transcription factor, ATF6p504. IRE1 oligomerises and activates its ribonuclease domain through auto phosphorylation. Activated IRE1 catalyses the excision of a 26 nucleotide intron from XBP1u mRNA, in a similar manner to pre-tRNA splicing5. Removal of this intron causes a frame shift in the XBP1 coding sequence resulting in the translation of a 376 amino acid, 40 kDa, XBP-1s isoform. Active ATF6p50 and XBP1 subsequently bind to the ER stress response element (ERSE) and the UPR element (UPRE), leading to expression of target genes encoding ER chaperones and ER-associated degradation (ERAD) factors involved in degradation of unfolded proteins6. The outcome of UPR activation increases protein folding, transport and ER-associated protein degradation (ERAD), while attenuating protein synthesis to restore ER homeostasis. 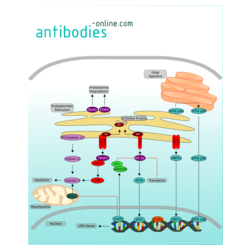 If these adaptive mechanisms cannot resolve the protein-folding defect, cells enter apoptosis.